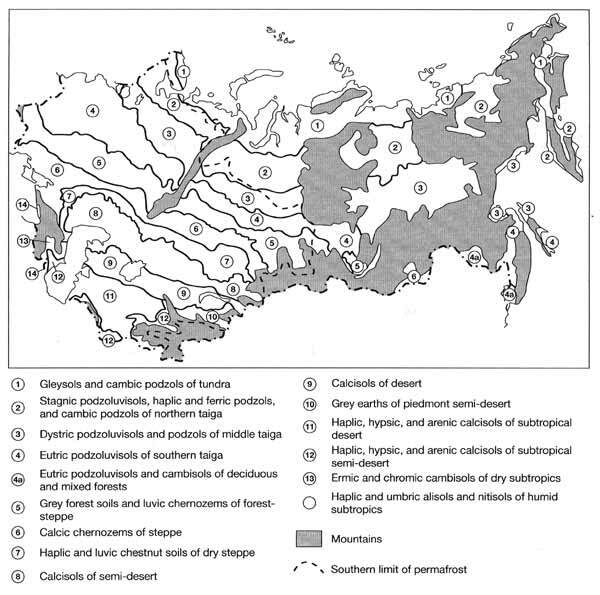 This group includes soils of the deciduous forest, forest-steppe, and northern steppe biomes. The autonomous soils of this group are grey forest soils and luvic chernozems. Heteronomous soils are usually solods (also known as planosols). 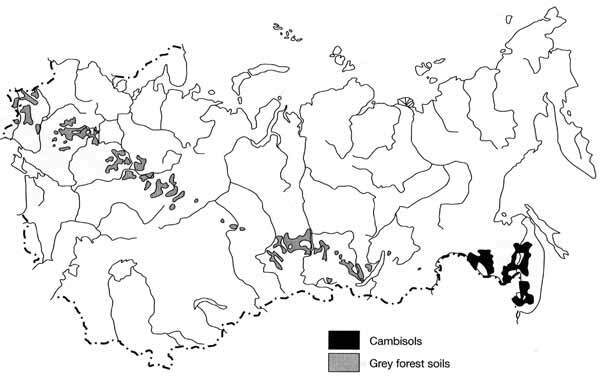 Grey soils or serozems develop under deciduous forests (Figure 4.3) on about 60 million hectares or 2.8 per cent of the total area of the FSU (Rozov, 1968; Simakova et al., 1996). This is one of the main agricultural areas of the region and diverse crops are cultivated on grey soils. Grey soils are mostly associated with well-drained hilly plains composed by loess-like carbonate loams. The grey soil's profile has a clear differentiation of clay and total chemical composition by eluvial-illuvial type (Akhryrtzev, 1979). Humic and eluvial horizons are impoverished in iron and aluminium oxides and accumulate carbonates. The accumulation of iron and aluminium oxides and the reduction of silica acid contents are typical of the illuvial В horizon. The reaction of the soil solution changes from weakly acid in the upper part of the profile to neutral and basic in the lower part. Only the upper part is unsaturated by bases. The gley variety of grey soils develops in depressions and weakly drained watersheds on clay deposits (i.e., in conditions of excessive moisture supply). Luvic chernozems (Figure 4.1) develop mainly on loamy carbonate rocks in well-drained areas of the Russian northern forest-steppe, in Western and Central Siberia, in the foothills of the western Cis-Caucasus and in the forest-steppes of Moldova (Prasolov, 1939; Krupenikov, 1967; Chernozemy SSSR, 1974; Lebedeva, 1996). Luvic chernozems are distinguished by the intensive accumulation of humus and weak eluvial-illuvial differentiation of the profile by clay fraction, physical clay, and total contents of sesquioxides. Morphologically, the eluvial-illuvial differentiation is expressed through the presence of a light flour-like powder in the lower part of the A horizon and the upper part of the В horizon. Soils have a weak acid reaction in the upper part of the profile and have extremely good physical properties due to the excellent water-resistant aggregate structure of their humic horizon. Planosols (or solods) occur mainly in the forest-steppe and steppe zones between stretches of grey soils and chernozems, and also locally in the southern steppe and semi-desert zones. They are most typical of the West Siberian forest-steppes. Planosols have a patchy distribution on the plains of northern Kazakhstan and the southern Far East under hydrophilous plant communities. Planosols with differing degrees of salinization occupy about 0.5 per cent of the total FSU territory (Rozov, 1968). They develop on flat poorly drained lands and in isolated depressions covered by vegetation represented by ash, birch, willow, and hydrophilous herbaceous species. Planosols are soils with clearly expressed differentiated profiles. They are distinguished by the presence of carbonates and readily soluble salts in the lower horizons and by distinct signs of gleying across the profile. The upper eluvial part is improverished in compounds of iron, aluminium, magnesium, calcium, sodium, but is relatively enriched by silica. The illuvial horizon has a neutral or alkali reaction and exchangeable sodium (occasionally in large quantities up 10 per cent or more of CEC). These properties are only typical of planosols and distinguish these soils from other clay-differentiated soils such as, for example, podzoluvisols.